After the trade deadline passes each year, there are inevitably reports about the trades that were discussed but never consummated. For instance, Ian Rapoport of the NFL Network reports that teams were trying to trade for Falcons pass rusher Vic Beasley (video link). Beasley has just one sack this year, and he has regressed considerably since his First Team All-Pro performance in 2016, but Atlanta believes it can make the playoffs this season, and it was not prepared to move a foundational piece like Beasley, who is under contract through 2019 via the fifth-year option. The Jets, desperate for pass rushing help, inquired on former Jaguars defensive end Dante Fowler over the summer, and they tried again at last week’s trade deadline, as Adam Schefter of ESPN.com details. The Rams ultimately acquired Fowler in exchange for a 2019 third-rounder and 2020 fifth-rounder, and while the Jets submitted a similar offer about a half hour before the 4pm deadline on October 30, they also wanted a fourth-rounder to come back to them. As such, Jacksonville pulled the trigger on the Rams’ offer. Interestingly, before dealing him to the Saints in August, the Jets offered quarterback Teddy Bridgewater to the Jaguars in a one-for-one swap for Fowler, per Jason La Canfora of CBS Sports. Jacksonville rebuffed that proposal, even though it knew that Fowler was probably on the way out, and given their QB struggles, that decision may have made a major difference in the Jags’ season. Fowler may not have been the Rams‘ first choice for pass rushing help. We already knew that Los Angeles had made a significant offer for Khalil Mack before he was dealt to the Bears, but Schefter writes that the Rams also called the Texans to discuss Jadeveon Clowney in the first weeks of the season, and as late as last week, they made a push to acquire the Bills‘ Jerry Hughes. Several teams, including the Eagles, called the Jets in an effort to acquire deep threat Robby Anderson, per ESPN’s Chris Mortensen (Twitter link). However, Gang Green opted to hold on to Anderson because the development of Sam Darnold remains the team’s top priority, and it did not want to remove one of Darnold’s biggest weapons. The Patriots are annually one of the most aggressive teams in the league when it comes to adding talent, as evidenced by their recent trade for Josh Gordon. With the trade deadline now just a couple of days away, New England is looking to make more moves. The team wants “to acquire some help in the defensive front seven by the deadline Tuesday”, and “they’ve had internal discussions about trading for linebacker Jamie Collins“, according to Jeff Howe of The Athletic. The Patriots traded Collins to the Browns in 2016, and now apparently have some interest in bringing him back. It would be an unusual move with a player being traded twice between two teams, but the Browns would likely welcome the relief of getting out of Collins’ contract, and it sounds like the Patriots are interested. Collins signed a four-year $50MM deal with Cleveland in 2017, and hasn’t lived up to that deal so far. Whatever happens, it sounds like the Patriots’ defense will look a little different by this time next week. 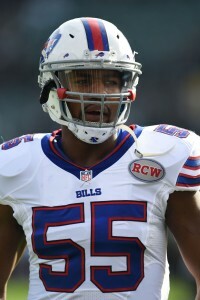 Bills defensive end Jerry Hughes “has been a hot name on the trade market”, but the “Bills have been reluctant to part with him”, a source told Howe. Howe thinks that Hughes would “be a good fit for the Patriots”, but doesn’t think Buffalo will decide to part with him. Hughes has been having a good season, notching 4.5 sacks in seven games. Jets tight end Neal Sterling “suffered his second concussion of the season” today against the Bears, and “likely will be lost [for] multiple games”, according to Rich Cimini of ESPN (Twitter link). The Jets are very thin at tight end, so this is a somewhat significant loss for New York. Bills running back LeSean McCoy has cleared the concussion protocol and will play Monday night against the Patriots, the team announced in a tweet. It’s a huge boost for Buffalo’s struggling offense as they look to pull of the massive upset in primetime. Jason La Canfora of CBS Sports says the odds of the Bills trading any veterans — like RB LeSean McCoy, whose name has recently surfaced in trade rumors — are very slim. La Canfora writes that it would take a “bounty” to pry McCoy or Jerry Hughes away from Buffalo, as the team considers both players, who are both signed beyond this season to club-friendly deals, to be vital veteran components of its rebuild. Ian Rapoport of NFL.com agrees, saying it could take as much as a second-round draft pick to land McCoy. This doesn’t come as much of a surprise, but Rapoport tweets that the Bills have no intention of playing newly-acquired signal-caller Derek Anderson, barring injury. Anderson is with the club to tutor rookie QB Josh Allen, not to take any of his playing time. From the “something to keep an eye on” department, Jenna Cottrell of 13 WHAM tweets that Allen asked wide receiver Kelvin Benjamin if he wanted to work on routes during pregame warm-ups today, and Benjamin told him no. The Bills acquired Benjamin at the trade deadline last year but have not gotten much production out of him, and he does not appear especially motivated to perform well in his platform year. Dolphins DE Cameron Wake recently underwent arthroscopic knee surgery but could be back as soon as next week, per Adam Schefter of ESPN.com. Normally such a procedure would require a four-week recovery period, but Wake is such a quick healer that he may make it back in a fraction of that time. Mike Reiss of ESPN.com observes that Patriots cornerback Jason McCourty is on pace to recoup the money that he lost when he agreed to a pay cut before the regular season. New England gave him the opportunity to make up the difference via incentives, and McCourty is well on his way to hitting those incentives. The same cannot be said for Tom Brady and Rob Gronkowski, however. Reiss also notes that Kenjon Barner, who has been shuttled on and off of the Patriots‘ roster several times since September 12, may have a little more job security right now. Barner’s former club, the Eagles, are very much in need of RB help, and the Pats know that if they cut Barner again, they may not get him back. Darryl Slater of NJ.com tweets that Jets defensive coordinator Kacy Rodgers, who is dealing with a serious illness, is on the sidelines for the team’s game against the Colts today. It does not sound as if he has resumed his coordinator responsibilities yet, but it is a good sign nonetheless. The Raiders and star defender Khalil Mack are embroiled in contract negotiations that could result in Mack being traded. If that happens, Rich Cimini of ESPN.com suggests that the Jets should pounce. Gang Green has little pass rushing talent at the moment, and the club has $82MM of projected cap room in 2019, with only one big contract (Leonard Williams) on the horizon. Oakland would demand at least a first-round pick in return, and in addition to negotiating a high-level trade, the Jets would also need to work out a long-term deal with Mack. Those types of deals are difficult to pull off, and it is still unlikely that the Raiders part with Mack, whom they can keep under club control through three more seasons if they so choose. However, if Oakland does begin entertaining offers, Cimini would not be surprised if the Jets are one of the first teams to jump on the phone. Jets OLB Lorenzo Mauldin is still around because of New York’s aforementioned dearth of pass rushers, but Mauldin, a 2015 third-round pick, has been dogged by injuries throughout his brief career, and he hasn’t been particularly effective even when he’s gotten on the field. As such, Manish Mehta of the New York Daily News tweets that Mauldin could be cut sooner rather than later, and that New York could let him go with an injury settlement (Mauldin is currently dealing with a leg issue that kept him out of the team’s preseason opener). In a full-length piece, Mehta says that Brandon Copeland, a former UDFA out of UPenn who signed a one-year deal with the Jets this offseason after missing all of 2017, has been very impressive in camp and has been taking first-team reps over the past few days. Given the Jets’ pass rushing needs, Copeland has a real chance to get plenty of playing time this season. We have written extensively on Tom Brady‘s new contract with the Patriots in recent days, and the moral of the story is that it looks as if Brady will continue playing through at least the 2019 season, and that the two sides could come to terms on another new deal next year in order to push some of Brady’s increased 2019 cap number into 2020. However, as Ben Volin of the Boston Globe tweets, since Brady and the Pats officially put pen to paper on August 9, 2018, they can’t renegotiate his contract again until August 9, 2019. Trent Brown, whom the Patriots acquired via trade with the 49ers earlier this offseason, is the favorite to replace Nate Solder as New England’s starting left tackle, per Mike Reiss of ESPN.com. Brown is eligible for unrestricted free agency next year, so he will have plenty of incentive to perform at a high level. Vic Carucci of the Buffalo News calls 2018 the most critical season of Bills DE Jerry Hughes‘ career. Hughes’ volatile on-field personality could be overlooked when he was posting double-digit sack totals earlier in his career, but his sack numbers have slumped since he signed a five-year, $45MM in 2015, so the unnecessary roughness and unsportsmanlike conduct penalties are a little harder to stomach. His $10.4MM salary in 2018 is the highest on the Bills, and while Buffalo could have cut him this offseason and saved a little cap room, the team could save $7.5MM by releasing him after the 2018 campaign, so he may need to show a return to his early-career form to stay in Buffalo and earn another $10.4MM next year. For what it’s worth, the Bills think Hughes’ sack numbers will be improved with the addition of Trent Murphy and (hopefully) some growth out of Shaq Lawson. Plus, Hughes did grade as a top-10 run defender (among edge players) last season, in Pro Football Focus’ view. The Bills shook up their defensive line rotation earlier today. The Dolphins are visiting with the increasingly-popular Bashaud Breeland today. Despite Jerry Hughes being set to take up $10.4MM of the Bills’ 2018 cap and the team having agreed to terms with Trent Murphy, it doesn’t look like Hughes is going anywhere. Buffalo will not be cutting or trading Hughes, Vic Carucci of the Buffalo News tweets. Despite the Doug Whaley regime green-lighting Hughes’ five-year deal in 2015, the team wants to keep as much defensive end depth as it can. Shaq Lawson isn’t in danger of being moved, either, per Carucci (on Twitter), despite also arriving under Whaley. The Bills have traded a few Whaley-era standouts recently, but Hughes and Lawson are in line to work alongside Murphy as the team’s defensive ends next season. Hughes will turn 30 during training camp and has not matched the back-to-back 10-sack seasons that occurred prior to his re-signing. But he still enjoyed a strong season, grading as a top-10 run defender (among edge players) last season, in Pro Football Focus’ view. A teammate of Johnny Manziel‘s at Texas A&M, tight end Cameron Clear joined the embattled quarterback among those suspended on Thursday, Ian Rapoport of NFL.com tweets. Like Manziel, Clear is also a free agent suspended for four games. The Colts signed him to a reserve/futures contract after the 2015 season but cut him in May. A 6-foot-5 tight end who would be a second-year player if given another chance after this suspension, Clear spent time with the Steelers last season but did not see any game action. Sheldon Richardson and Rolando McClain were also suspended on a news-dump Thursday before the July 4 weekend, with Demarcus Lawrence‘s four-game ban being upheld as well. Former Chargers, 49ers and Cowboys special teams contributor C.J. Spillman was convicted of sexual assault Thursday, Claire Z. Cardona of the Dallas Morning News reports. The 30-year-old spent most of his six-year career with the 49ers but last played as a Cowboys reserve defensive back in 2014. The incident that prompted the conviction, which carries a two- to 20-year prison sentence, occurred Sept. 20, 2014. Spillman played for the Cowboys for the rest of that season. McClain’s suspensions in Dallas now total 14 games after the middle linebacker began the 2015 season with a four-game ban. Todd Archer of ESPN.com advocates the Cowboys cut ties with him despite re-signing the soon-to-be 27-year-old this offseason. McClain is signed to a one-year, $3.375MM deal as a stopgap until Jaylon Smith proves ready. The latter does not look like he’ll be ready to play this season, and the Cowboys now have three of their starting front seven — McClain, Lawrence and Randy Gregory — set to begin 2016 suspended. After a potential felony charge was reduced to a misdemeanor for resisting arrest, Seahawks reserve quarterback Trevone Boykin received probation on Thursday, Austin Knoblauch of NFL.com reports. The rookie UDFA incurred this charge after a Dec. 31, 2015 incident before TCU’s Alamo Bowl, a game for which Boykin did not dress. Datone Jones will shift to a stand-up, edge-defending position after he relocated there late last season, Wes Hodkiewicz of Packers.com reports. The Packers plan to play their 2013 first-round pick at outside linebacker in a 3-4 set and on the outside in passing-down sets, which he did beginning with a two-sack game against the Vikings last November. Given the team’s depth at each position, Jones’ role adjustment is interesting. As Roster resource shows, the Packers are more stocked on the edge than they are inside in their 3-4 set. Julius Peppers, Nick Perry and a recently relocated Clay Matthews reside at outside linebacker. The Bills will also look to move Jerry Hughes into more of a stand-up outside-linebacking role, Tyler Dunne of the Buffalo News reports. Hughes had his best seasons as a 4-3 end in 2013-14, when he notched 10 sacks in each slate en route to signing a five-year, $45MM contract. ESPN.com’s Rich Cimini says there are a variety of reasons why the Jets wouldn’t trade Geno Smith this season. There wouldn’t be much of a market for the quarterback, and if the Jets ultimately make the playoffs, they wouldn’t want to rely on Bryce Petty as insurance to Ryan Fitzpatrick. Regardless, the writer opines that Smith will be on his way out during the offseason, as Cimini can’t see how the 25-year-old fits in the team’s future plans. The Browns worked out four tight ends on Friday, according to Aaron Wilson of the Houston Chronicle (via Twitter): Cameron Clear, Konrad Reuland, Brian Leonhardt and Connor Hamlett. Texans safety Eddie Pleasant was fined $8,681 for his unnecessary roughness penalty during last weekend’s loss to the Falcons, according to Wilson (via Twitter). Bills defensive end Jerry Hughes earned more than $30,000 in fines for his actions during his team’s contest against the Giants, according to Ralph Vacchiano of the New York Daily News. One fine was for unnecessary roughness, while the other was for abusive language toward an official. Vikings cornerback Xavier Rhodes was fined $17,363 for his horse-collar tackle on Broncos wideout Emmanuel Sanders, reports ESPN.com’s Ben Goessling. Jeremy Maclin, WR (Chiefs): Five years, $55MM. $22.5MM fully guaranteed. $12MM signing bonus (Twitter links via Joel Corry of CBSSports.com). Julius Thomas, TE (Jaguars): Five years, $46MM. $21MM fully guaranteed. $28.3MM in first three years (Twitter link via Albert Breer of the NFL Network). Jerry Hughes, DE (Bills): Five years, $45MM base value. $7MM signing bonus. $11.775MM fully guaranteed. $1MM annually in sack-based incentives (Twitter links via Corry and Tom Pelissero of USA Today). Jared Odrick, DL (Jaguars): Five years, $42.5MM. $22.5MM guaranteed. $5MM roster bonus in 2015 (Twitter link via Aaron Wilson of the Baltimore Sun). Brandon Flowers, CB (Chargers): Four years, $36.4MM base value. $20.5MM guaranteed. $8MM signing bonus. $2.25MM first-year cap hit (Twitter link via Wilson). Curtis Lofton, LB (Raiders): Three years, $18MM base value. $10MM guaranteed. $6.5MM in first year, including $3.5MM roster bonus (Twitter links via Pelissero and Wilson). Kendall Langford, DT (Colts): Four years, $17.2MM base value. $2.5MM guaranteed (Twitter link via Mike Garafolo of Fox Sports). Brian Hoyer, QB (Texans): Two years, $10.5MM base value. $3.75MM roster bonus to be paid this month. $5.25MM annual cap hits (Twitter link via John McClain of the Houston Chronicle). A.J. Hawk, LB (Bengals): Two years, $3.25MM base value. $500K guaranteed (Twitter link via Pelissero). Torrey Smith, WR (49ers): Five years, $40MM base value. $8MM signing bonus. $8.75MM fully guaranteed. $3.6MM first-year cap hit (Twitter links via Corry). Bryan Bulaga, T (Packers): Five years, $33.75MM base value. $8MM signing bonus. $3.6MM first-year cap hit (Twitter links via Rob Demovsky of ESPN.com). Stephen Paea, DT (Washington): Four years, $21MM. $7.85MM guaranteed. $5MM signing bonus (Twitter link via Wilson). Corey Peters, DT (Cardinals): Three years, $9MM base value. $5.75MM guaranteed. $2MM signing bonus (Twitter links via Wilson). Justin Durant, LB (Falcons): Three years, $10.8MM base value. $4.5MM in 2015. $3MM available in incentives (Twitter link via Pelissero). Dwan Edwards, DT (Panthers): Two years, $4MM base value. $1MM signing bonus (Twitter link via Wilson). Sean Weatherspoon, LB (Cardinals): One year, $3.58MM base value. $1.25MM signing bonus (Twitter link via Wilson). Major Wright, S (Buccaneers): Two years, $3MM base value (Twitter link via Pelissero). 9:53am: The Bills have officially re-signed Hughes, the team announced today (via Twitter). 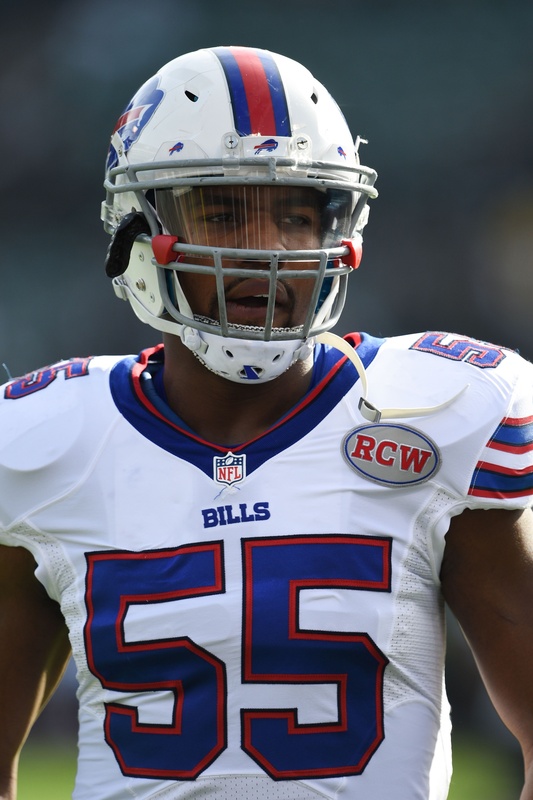 6:57am: The Bills and edge defender Jerry Hughes have agreed to terms on a five-year contract that will keep Hughes in Buffalo, reports Vic Carucci of the Buffalo News. The agreement will keep Hughes off the open market when free agency begins tomorrow. Multiple reports, including tweets from Adam Schefter of ESPN.com and Ian Rapoport of NFL.com, indicate the five-year deal will be worth about $45MM, with Rapoport adding that $20MM of that amount will be guaranteed. However, a source close to the team tells Carucci that the $45MM figure isn’t quite accurate. Regardless of whether the final amount lands, Hughes won’t come cheap. A league source tells Carucci that at least six clubs expressed interest in signing the 26-year-old. Clubs like the Jaguars, Raiders, Colts, Browns, and Giants had previously been mentioned as possible suitors. besides Buffalo. Hughes is coming off his second consecutive 10-sack season for the Bills, and his first year as a full-time starter. The former first-round pick also racked up 54 tackles and forced three fumbles, joining forces with Mario Williams, Kyle Williams, and Marcell Dareus to make up one of the league’s most dominant defensive lines. Those three players were already on the books for a combined $33.86MM cap hit for the 2015 season, so a new deal for Hughes figures to push that figure up over $40MM, barring other restructures or extensions. That’s a significant amount to invest in a defensive line, but that line is the primary reason Buffalo’s defense has been so good in recent years, ranking in the top five in DVOA in both 2013 and 2014, per Football Outsiders. When I ranked this year’s top 50 free agents, I named Hughes the fifth-best player in free agency and the top pass rusher on the unrestricted market, after Justin Houston and Jason Pierre-Paul were franchised. With Hughes set to finalize a new deal with the Bills, teams eyeing a top pass rusher could shift their focus to players like Pernell McPhee, Greg Hardy, Brandon Graham, and Jason Worilds. Carucci first reported on Sunday that Hughes and the Bills were closing in on a new contract.